Announced last year, Professor Layton VS Ace Attorney is a Level-5 and Capcom crossover between the two logic-based series. Kotaku was on-hand today at the Tokyo Game Show to try the first playable demo of this highly anticipated game. The demo was actually split into two parts, one following Phoenix Wright and the other following Professor Layton. In the Ace Attorney section, Phoenix was tasked with defending a clearly mind-controlled girl accused of being a witch. 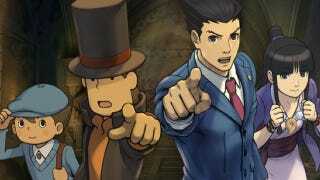 Other than Phoenix and Maya, all the characters were brand new—including the prosecutor and the judge. The first witness was an incredibly eccentric "professional security guard" who captured the girl—so it's pretty much par for the Ace Attorney course. Gameplay-wise, the system was identical to past Ace Attorney titles—except that it returned to the old "five-chance exclamation point" system from the earliest games in the series instead of the more modern lifebar. Interestingly, while animated with 3D models like Ace Attorney 5, the art style was clearly different. In the Professor Layton section of the demo, Layton and Luke were visited by the aforementioned witch girl. However, after opening a window the girl was abducted by a monster causing the pair of puzzle-solvers to follow in pursuit. Their side of the demo played exactly like its parent series, with both coin hunting and puzzles. The demo's two puzzles were nothing new for longtime players of the series. But as always, the cutscenes were beautiful and exciting. While neither half of the demo was fully voiced, several sections in each were—with the Layton voice actors returning from their series, and the Ace Attorney actors reprising their roles from the live-action movie. All in all, it really felt like I was playing two different games connected by the characters and story instead of a mixture of the two. And while I hope for special puzzles that mix the games' two different puzzle styles in the final product, I found my time with Professor Layton VS Ace Attorney enjoyable as a fan of both series.